Wardlaw, who prefers to be called Half, is lucky enough to have the gift of gab. He expresses himself extremely well not only in rap, but in chat, as well. Sitting in a dimly lit stairway, he speaks straight into the camera (and to Hadleigh-West, who sits behind it), giving the low down of his life in this ‘hood, and revealing his aspirations to rise above. Wardlaw avows that his word — his rap — is a reflection of his life, the truth of all he’s been through. His is, indeed, disturbing poetry, a rhymed expression of an American sub-culture that’s steeped in violence, drug abuse, sexual exploitation, and grim expectations about social welfare and personal well being. Half-a-Mill’s rap reveals his hardship circumstances quite clearly, and through his words and the view of his environment provided by Hadleigh-West’s filmed observations, you see the duress and ugliness of it all. The vision is deeply disturbing. It is, in fact, a rare insider glimpse at a lifestyle of deprivation that drums all ambition out of some youngsters, and pushes others to do whatever they need to do and can do to succeed, which mostly means gaining some form of respect their peers, as well as garnering bling and the other trappings of status in a consumer-oriented have-not community. Most often, the neighborhood kids take to hustling, pushing drugs, fighting for territorial control, pimping, scamming, stealing and plying other antisocial and illegal trades that they see as their only viable options. And, more often than not, these ‘jobs’ land them in jail. Or, with shocking frequency, they are executed on the streets. Actually, what makes this film so wrenching is that Half-a-Mill and his gang of thugs (his friends and supporters, aka the Godfia Criminals) are likable guys. They’re really smart, gifted, loyal, and quite capable of genuine kindness. And, they clearly show potential, but they cannot find opportunities that allow them to grow and show it. One by one, they fall victim to their environment. Player Hating is wrenching to watch. Difficult to watch. Important to watch. At a moment in human history when masses of people in the US and around the world are applauding the story set forth in The Hunger Games (the novel and recently released narrative film in which young warriors are pitted against each other in battle to the death of all but one) as a vehicle for entertainment, and readily embracing the social and political set up set forth in this work of fiction as a distracting amusement, Player Hating should be — must be, actually — viewed as a nonfiction companion piece. Think of Half-a-Mill as one of those warriors who is forced by random selection to do battle for his life. The weapons he chooses are poetry, gangsta behavior and guns. Consider this as, in a way, the real life version of The Hunger Games, the nonfiction story in which the consequences of the battles are permanent. Yeah. Equally skilled as storyteller and social commentator, Hadleigh-West lets her subjects speak for themselves, allows their revelations to raise concerns for her audiences and, ultimately, allows her audiences to draw their own conclusions. 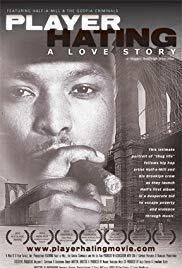 What makes this such a compelling film is that it’s often hard to tell whether Hadleigh-West is the consummate rap fan who’s goal is to produce an up close and personal puff piece about Half’s becoming an entertainment icon, or whether she’s unobtrusively investigating the impact his ghetto background has had on his outlook, his art, and the arc of his life. In fact, she’s doing both, and so even-handedly so that you may find yourself a bit guilt-riddled because you become so caught up in the film’s entertaining story — the suspense of whether Half will be able to drop his record, make it a success, rise above his childhood circumstances and make it to a better lifestyle. Well, this is a documentary and Half-a-Mill’s story has been told elsewhere, so perhaps you already know how it goes. But, whether you know the conclusion or not, thanks to Hadleigh-West, the journey you take with Half-a-Mill and his crew to get there is gripping, and a real revelation.